In the world of business and commercial applications, it’s essential to make a good first impression for your clients or customers. Business is all about customer satisfaction; if your customers do not like your products or services, they will likely look elsewhere for future assistance. From cultivating positive relationships with your customers to delivering a consistent level of quality, you likely spend a lot of time focusing on enhancing the experience for your guests. When it comes to making a good first impression, you will be hard-pressed to impress your clientele if your company’s interior is looking worn-down and outdated. AZ Drywall Finishing is proud to be your trusted team of drywall contractors in Chicago, delivering amazing outcomes for clients across many industries. Our commercial drywall company has been in the business of making your business look great since 1999! Our drywall finishers understand the importance of creating a quality first impression. We work hard to create the best outcome for projects of all sizes, delivering the best metal stud framing, acoustical ceilings, and drywall installation and finishing services. Today, we’ll explore the value of your first impression, as well as the importance of keeping your building’s exterior and interior at its best year-round. Looking for a local drywall company for your addition or renovation? Contact us today for an easy and accurate quote! Any architect or interior designer will tell you how valuable the first impression is when clients arrive on-site, and this part of your property should be one of the first focuses when planning a commercial renovation. The human brain is constantly absorbing visual cues and details, unconsciously compiling data to form impressions that are historically lifesaving. Once this impression is made up about a person or place, it can affect the quality of the relationship over its lifetime. Once a person has formed an impression of your business, it can prove to be very difficult to change it. This battle starts at the entrance to your building, including the foyer and property landscaping. The entrance is the threshold where your guests and customers start to gather an impression of how the rest of the building will look. One aspect you should focus on is the cleanliness of your entrance. Even minor scuffs and marks can prove to be very detrimental. For more long-term improvements, you can look to renovations via new drywall installation, texturing, and paint. Our drywall finishers can work with you to create stunning and unique visual displays to truly captivate your audience. If you’re a franchise owner, we can provide stud framing and drywall hanging to perfectly match your specifications as well. Once your entrance is complete, the pressure will be on your team to match the high quality of our drywall company! Businesses of all types go through a lot of wear and tear through the years, resulting in a space that can majorly affect the mood of your employees and guests. If you’re considering drywall renovations for your existing site, or you’re planning on building an entirely new structure, it’s important to achieve a consistent and high level of quality throughout the whole building for the best results. Our drywall contractors are here and ready to build quality solutions for every inch of your structure, installing drywall, hanging acoustical ceiling tiles, and more! Professionalism. Appearances are a big part of business, and professional drywall finishing will help to ensure that your company looks sharp and concise. Even minor aesthetic problems can sap the level of quality you’re trying to represent. Employees are often held to a high standard when it comes to appearances, and the same should be said for your building. We can work with you to create a design scheme that is both professional and affordable. Customer care. One major aspect of first impressions that many people do not consider is the value of taking care of your business. If your property is not taken care of properly, it will seem much more likely that you’ll treat your clients the same way. Branding is all about comprehensive quality, and investing in expert improvements can help to establish trust when translating into customer service. Reliability. Businesses that seem to be held together with duct tape will likely concern customers and clients that come to visit. People like knowing that they are investing their time and money in a reliable establishment that is here for the long haul. 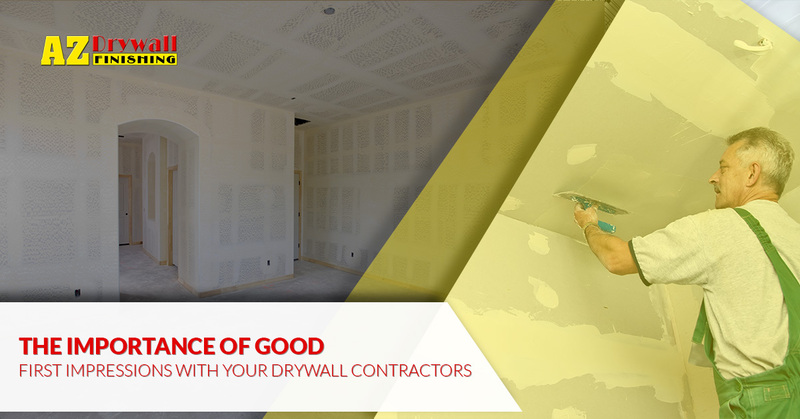 Investing in quality drywall installation and painting services helps to comfort your guests, letting them know that you are confident in your ability to continue succeeding in this modern economy. Likewise, our commercial drywall contractors strive to deliver the highest level of quality on every project, helping you now and in future projects. As you can see, appearances and professionalism play major roles in creating a quality first impression for your clients or customers. Regardless of the industry you are in, clean and pristine interior elements are vital for establishing trust. If you are looking for drywall contractors in Chicago to create amazing first impressions for your new or existing building, be sure to contact us today for further assistance!